The Byron phase of the settlement layer (Cardano SL) was launched by IOHK, Cardano Foundation, and Emurgo. It enabled the launch of ada cryptocurrency and allowed users to transfer and trade ada. Metadata associated with address. Stake pool data, fee schedule, url, embedded intent of transaction, etc..
GUI UX and UI coming in Blog post "soon"
The Shelley phase will transition Cardano SL to a completely decentralized system which will allow all users to participate in the protocol, and get rewards for producing blocks by staking individually or within stake pools. The Basho phase will be focused on performance, security, and scalability improvements. It will enable Cardano to scale to millions and billions of users. The Voltaire phase will add a treasury system and governance, enabling sustainability and self-sufficiency for Cardano. IOHK working on Extended UTxO Mar/19? The backbone of building smart contracts with the highest possible degree of security, auditability and correctness. Cardano is the most authoritative, researched and vetted cryptocurrency project on the planet. See the linked resource for the list of papers produced by the research initiatives of IOHK. Need to scale to Bilions of users and able to process many tx/sec. including off-chain. Decentralized projects need systems in place to ensure trust-less longevity. Without a centralized point of development (or failure) a solid foundation for sustainability is paramount. Bitcoin is the first generation crypto currency, establishing bedrock for trust-less, immutable, POW ledgers. Ethereum was 2nd generation and lead the way to putting a programming language on the blockchain giving us the concept of smart-contracts and empowered the ICO movement. Cardano is the 3rd generation and builds on the legacy of Bitcoin and re-evaluates the concepts behind ETH to deliver the worlds most authoritative, researched and vetted smart-contract platform. "Choosing Haskell for protocol development was the most difficult choice." "The protocols that compose Cardano are distributed, bundled with cryptography and require a high degree of fault tolerance." "One of the primary reasons for choosing Haskell is that it provides the right balance of practicality and theory. Specification derived from white papers looks a lot like Haskell code, and connecting the two is considerably easier than doing so with an imperative language." More in-depth about "Why Haskell?" 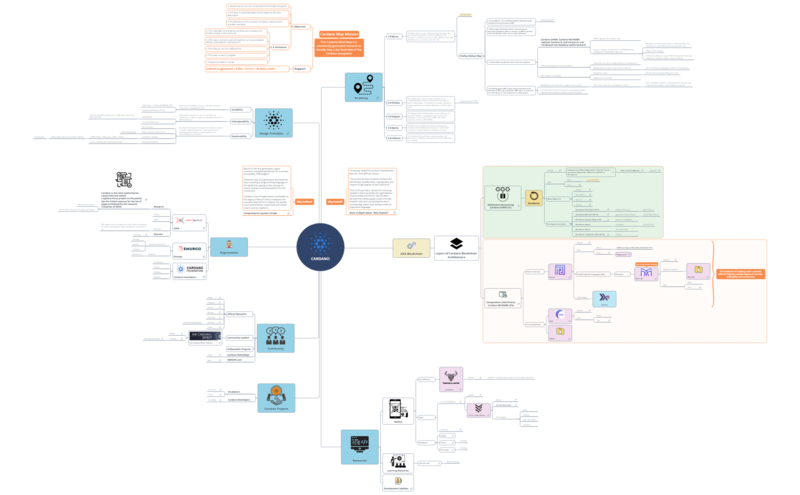 This Cardano Mind Map is a community generated resource to visually map a top level view of the Cardano ecosystem.